Clare teaches you the skills that make difficult conversations a breeze and explains the empathic listening techniques that are the foundation of effective communication. Hard Cover Book. 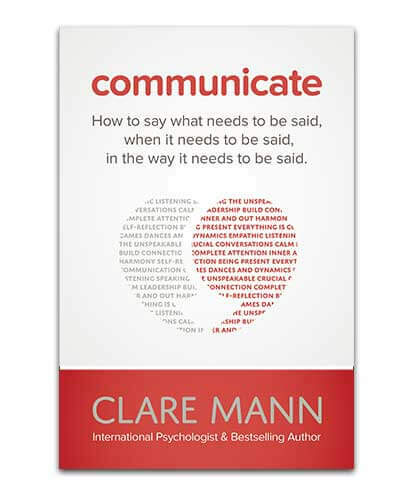 From the best selling author and psychologist Clare Mann, comes a unique and much needed book about how to have that difficult conversation. Clare Mann explains in simple language the games, dances and dynamics that occur within ourselves and other people that must be addressed if we are to make sense of our interactions. Clare teaches you the skills that make difficult conversations a breeze and explains the empathic listening techniques that are the foundation of effective communication. She shows you how to achieve the personal transformation that must take place within ourselves, and how to combine this with the skills that will help you navigate conversations to improve all your relationships. It is enriched by comments from over twenty leaders and senior executives across three continents whose expertise in communication and leadership has been shared with thousands of people around the globe.